81:6 And the Egyptians buried all their first born whom Yahweh had smitten, and all the Egyptians buried their slain for three days. 81:7 And the children of Israel traveled from Succoth and encamped in Ethom, at the end of the wilderness. 81:8 And on the third day after the Egyptians had buried their first born, many men rose up from Egypt and went after Israel to make them return to Egypt, for they repented that they had sent the Israelites away from their servitude. 81:9 And one man said to his neighbor, Surely Moses and Aaron spoke to Pharaoh, saying, We will go a three days’ journey in the wilderness and sacrifice to Yahweh our eloahi. 81:10 Now therefore let us rise up early in the morning and cause them to return, and it shall be that if they return with us to Egypt to their masters, then shall we know that there is faith in them, but if they will not return, then will we fight with them, and make them come back with great power and a strong hand. 81:11 And all the nobles of Pharaoh rose up in the morning, and with them about seven hundred thousand men, and they went forth from Egypt on that day, and came to the place where the children of Israel were. 81:12 And all the Egyptians saw and behold Moses and Aaron and all the children of Israel were sitting before Pi-hahiroth, eating and drinking and CELEBRATING THE KHAG (FESTIVAL) OF YAHWEH. 81:13 And all the Egyptians said to the children of Israel, Surely you said, We will go a journey for three days in the wilderness and sacrifice to our eloahi and return. 81:14 Now therefore THIS DAY MAKES FIVE DAYS SINCE YOU WENT, why do you not return to your masters? This much can be agreed upon by all sides. The Israelites began their physical journey from Rameses to Succoth on Abib 15. Yashar 81:5 confirms that not only did the Israelites begin their physical travel on Abib 15 but they also arrived at Succoth the very same day. We will now advance to Yashar 81:12 where Pharaoh and his Egyptian army catch up to the Israelites in order to bring them back to Egypt. According to Yashar, when the Egyptian army met up with the Israelites they were celebrating the KHAG (FESTIVAL) OF YAHWEH. This Festival could be none other than the last day of the Khag of Unleavened Bread! 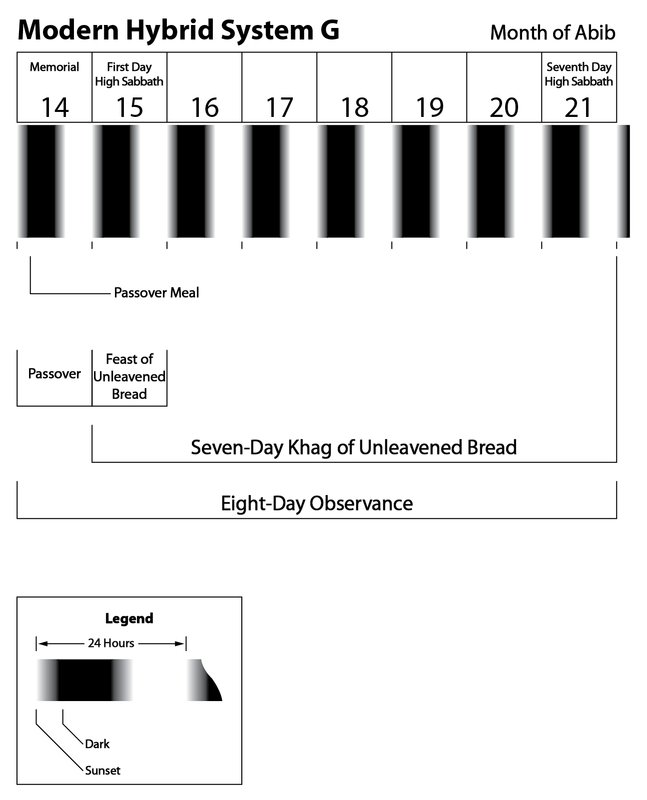 It should be noted that the last day of the Khag of Unleavened Bread would take place after sunset, the beginning of the day. The Egyptians then proceed to issue the following statement regarding the number of days that had transpired since the Israelites began their travel from Rameses. In other words, at the very time that the Egyptians were speaking to the Israelites it was the fifth day of the Israelites’ departure from Rameses! Let us now do the math and find out what day of Abib that the last day of the Festival of Unleavened Bread falls on. We would all have to agree that we should start our count from the day that the Israelites began their physical journey from Rameses. We will now proceed to count off 5 days of travel. Needless to say, there seems to be an apparent problem with the dates for Abib. According to the Book of Yashar, the Egyptians were speaking to the Israelites on Day 5 which was the last day of the Festival of Unleavened Bread. 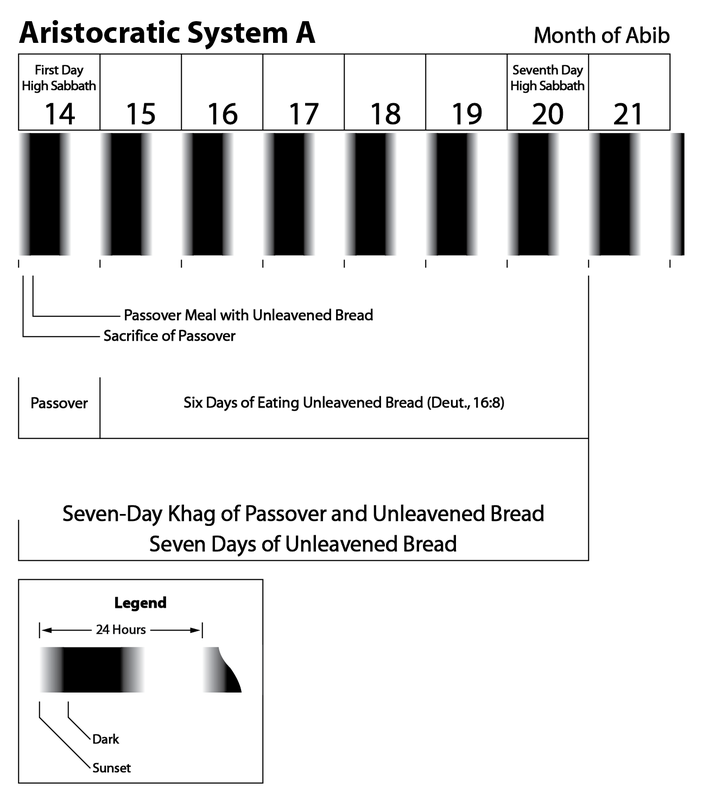 As our countdown shows, we can’t even satisfy the requirements for the Quartodeciman practice (System A) of a 7-day Festival of Passover/Unleavened Bread which would place the last day of Unleavened Bread on Abib 20. Of course, this has a much more damaging effect on the 8-day construct (System G) which is practiced by most Sacred Name groups of today where the last day of Unleavened Bread occurs on Abib 21. At this stage of analysis, one might conclude that the Book of Yashar is in error should summarily be discarded, void of any reliable facts that could be depended upon for sound scriptural doctrine. As a second thought, if one were to take a closer examination, maybe the Book of Yashar isn’t really wrong after all. The first observation about the Book of Yashar is that it was written from a Hebrew perspective. Therefore the days are reckoned from the view that the 24-hour day begins and ends at sunset. In Yashar 81:13-14 notice that it is Egyptians who state how many days had transpired since the Israelites began their physical journey out of Egypt. Therefore, logic dictates that the days have to be reckoned from an Egyptian perspective, not a Hebrew one. Consequently, one must recognize that the Egyptian day, unlike the Hebrew day, began and ended with sunrise! It would now be prudent to review our thinking process regarding Yashar 81:14. Not only did the Israelites leave in full sight of the Egyptians but the Egyptians were burying their dead which would indicate these events occurred during the daytime! It is clearly evident that Book of Yashar is correct after all! 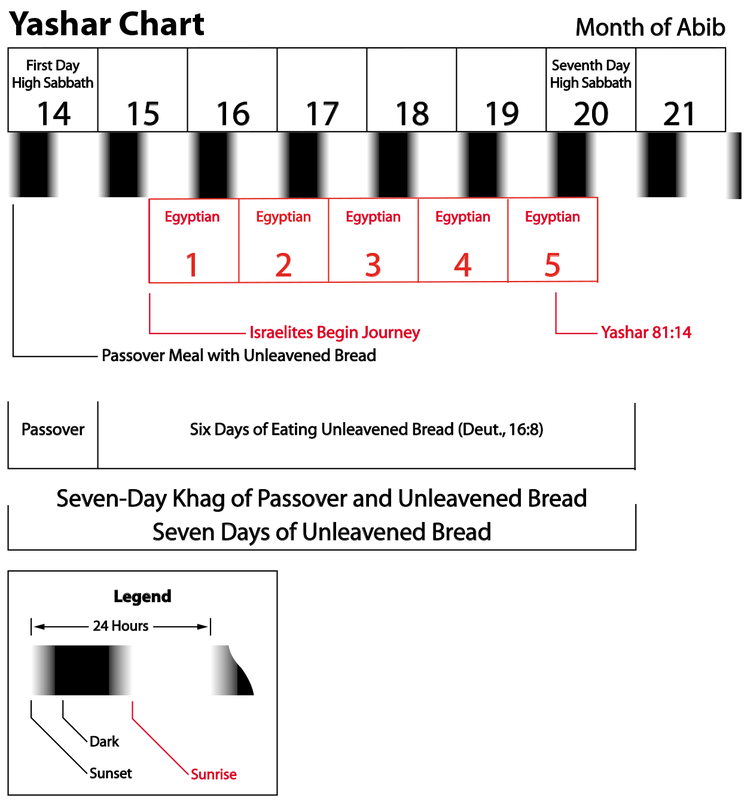 The Festival of Passover/Unleavened Bread is a 7-day Festival being Abib 14-20. Even if one were to take the alternate view that the Egyptian day began and ended at midnight it makes no difference. The result is the same. More importantly, there is no possible way that one can derive an 8-day scenario with Abib 14-21. Therefore it is most evident that it is also impossible to construe a 7-day Festival of Unleavened Bread to be Abib 15-21. What the Book of Yashar demonstrates regarding the Festival of Passover and Unleavened Bread is what Scriptures have shown all along. This entry was posted on 04/07/2014, 6:04 pm and is filed under Book of Jasher, Book of Yashar, Calendar, Easter, Exodus, Feast Days, Holy Days, Passover, Quartodecimans, Religion, Unleavened Bread, Yahshua, Yahushua, Yahweh. You can follow any responses to this entry through RSS 2.0. You can leave a response, or trackback from your own site.